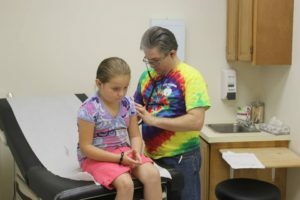 Grace Community Health Center, Inc. (GRACE) was started in January 2008 as a federally qualified health clinic to offer an extensive range of care and treatment to patients regardless of their income level or ability to pay. Front-line, preventive medicine is the main focus at its 26 clinics – 23 of which are located in schools – and a mobile dental clinic. 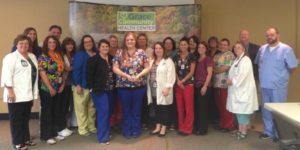 In October, GRACE will add a women’s health clinic in Corbin to its facilities. Kentucky lags behind the nation in the number of physicians per capita. In rural areas, this problem is even worse with two-thirds of Kentucky’s population in rural areas but only one-third of the doctors are outside metro areas. GRACE is helping fill that need with 44 full-time employees, including one physician and eight nurse practitioners. More than 10,000 patients and 122,000 encounters have been seen since GRACE opened its doors. But it’s a recent role that caught the attention of the BBC, which sent a reporter from Great Britain to Clay County to learn about kynect and conwooton2duct an interview with GRACE employee Jennifer Gates. She is one of four employees who assists families and businesses navigate the Kynect health-care system to obtain affordable insurance. They have helped more than 1,500 people sign up for insurance or the recently expanded Medicaid program, including a woman who had been diagnosed with cancer and didn’t know where to turn and another whose family – including her parents – never had health insurance. Kentucky Highlands Investment Corporation made a loan to GRACE in November 2009 as part of a financing package, along with lending partner Southern Kentucky Economic Development Corporation. GRACE used the funds to purchase facilities and make property improvements, and Stanley credits Kentucky Highlands’ investment as being critical to GRACE’s continued growth.